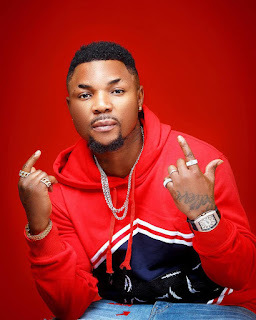 Contoversial Nigerian Artist and self acclaimed Musical Taliban Oritse Femi has decided to raise some dust in the entertainment industry as he has just declared himself the biggest artist Nigeria has ever produced. He also asserted that some persons are waiting for him to buy them cars before they will play his songs. 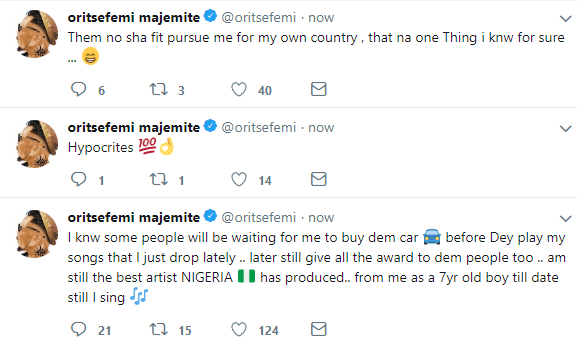 He tweeted from his official twitter handle saying"
"Them no sha fit pursue me for my country,that one na thing i knw for sure"
"I knw some people will be waiting for me to buy dem car before dey play my songs that i just drop lately...Later still give all the award to dem people too...Am still the best artist Nigeria ever produced.From me as a 7 year old boy till date still i sing"